Trump Claims Tear-Gassed Migrants Are "Grabbers" Using Strangers' Children As Human Shields [VIDEO] - Joe.My.God. Last night before holding a pair of Mississippi rallies in support of Sen. Cindy Hyde-Smith, Glorious Leader again said something really stupid. 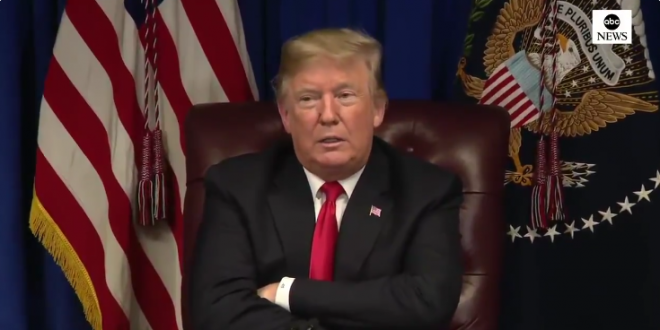 Pressed about his use of the term “grabbers” and whether he was suggesting the women photographed with children fleeing the tear gas were not the children’s real mothers, Trump said he was not and acknowledged he did not know the identities of those at the border crossing on Sunday. “It’s a term that’s used because, as you know, many people, it’s a very violent, horrible thing, that they feel they have an advantage when they’re with a young child, and they call them ‘grabbers.’ . . . I don’t know who was there yesterday,” he said. Trump insists that the only way to stop “grabbers” is to tear gas them along with the children they’re “grabbing.” That will teach those innocent children not to be in the proximity of a “grabber.” Nice going toddlers. In a new Facebook post, @DHSgov Secretary Kirstjen Nielsen addresses what happened on Sunday, at the San Ysidro Port of Entry: https://t.co/zf3Vph0Wo1.